Stars and Stripes is the 2nd iteration of the watchface line celebrating the 2017 Independence Day holiday in the USA. 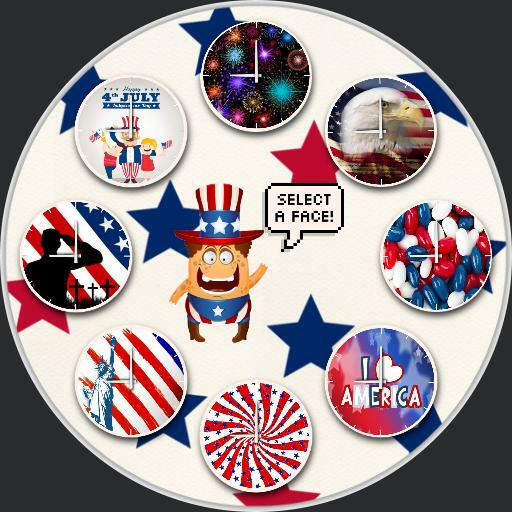 Following the popular Independence Day watchface released in early June, this patriotic watchface features 8 different faces to choose from. From color changing fireworks, to the bold American soldier, you will definitely find a face that helps represent your version of this holiday and helps you celebrate in style. All faces feature the day, date, and a discreet battery meter along the perimeter, as well as unique dim modes for each. To use, simply select which face youd like once the watch is loaded. To get back to the selection screen, tap the center of the face.